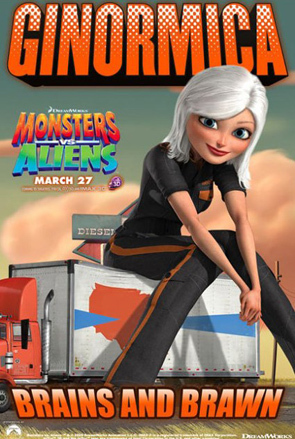 We were just sent over four new retro character posters for DreamWorks Animation's upcoming Monsters vs Aliens animated feature. I'm sure I don't need to explain that these are designed to look like classic movie posters. While the story is new, the film is an animated throwback to those kind of classic movies. 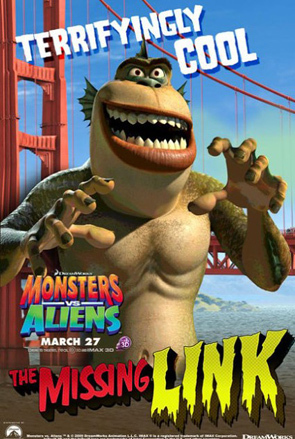 DreamWorks' concept for this was to combine the classic monster movies with classic alien movies, and thus we now have Monsters vs Aliens. So check out these four new posters below and don't forget to pick up your 3-D glasses to see the 3-D trailer during the Super Bowl next weekend. 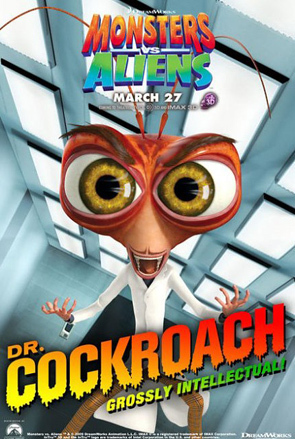 Providing their voices for the film are Hugh Laurie as Dr. Cockroach, Reese Witherspoon as Ginormica, Will Arnett as The Missing Link, Rainn Wilson as Gallaxhar, and Seth Rogen as B.O.B. (not pictured). Monsters vs Aliens is directed by DreamWorks filmmakers Rob Letterman (of Shark Tale previously) and Conrad Vernon (of Shrek 2 previously). Oddly, DreamWorks never revealed who the writers were, which makes me a bit worried that this was a studio-wide collaboration. 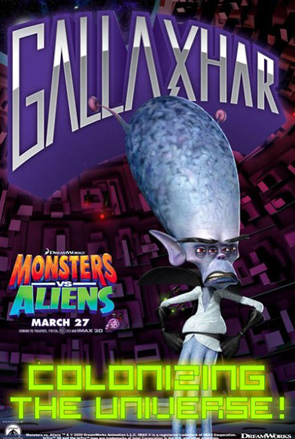 Paramount will debut Monsters vs Aliens in both IMAX 3D and regular theaters on March 27th, 2009 next year. See everyone in theaters! This looks like garbage I wouldn't even show to my 6 yr old, much less watch myself. I'm sick of the same generic animated films coming out each and every year. And why is Seth Rogen in everything nowadays? I like the guy, I think he's funny. But I don't want to see him in 4 movies a year. Space it out man! Exercise some restraint, pick and choose your roles. Don't just jump at everything! Give us 2 a year that are as funny as Knocked Up, 40 Year Old Virgin and Superbad, and I'll be a happy camper. Anyway, back to animation... Not looking forward to this, but I am looking forward to 9. If you haven't heard of it I suggest you check it out, it looks great! Definitely something different in the world of animated films. Not completely original, but different from the craptastic Wall-E or all of those other crappy Pixar/Dreamworks animated films. I actually want to see this. I love the idea of an animated movie that starts out like an alien movie and the trailer really grabbed my attention. These posters aren't great, though. 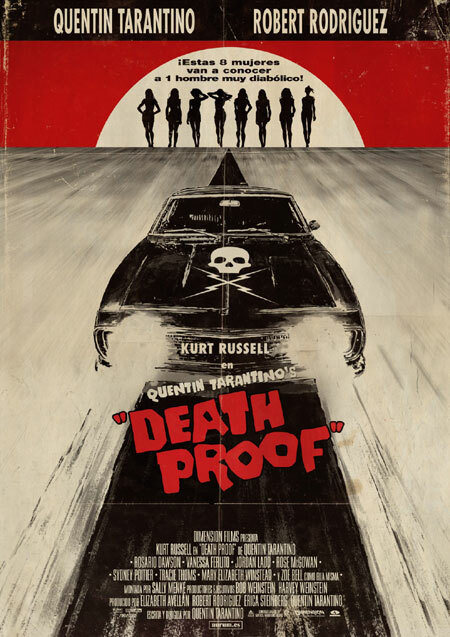 Boring posters to say the least, but I am very interested in seeing this film after seeing a 20 minute sneak peak of it. Not too retro, but at least the movie looks kinda fun. It's just that it's... Dreamworks. I see what yoy guys are saying. These look really slapped together. They're not very retro for being retro. It's a weird middle ground. Still stoked for the movie though. Damn! Typing error... And twice!! XDDD SUPPOSE.